Spacious and modern, in the old town, close to the beach. Very spacious apartment that occupies the entire top floor of a classic French house in the middle of Le Suquet – Cannes old town and historic center. Total 68 m2 and high ceilings that make the apartment exceptionally large and airy to be in Le Suquet. 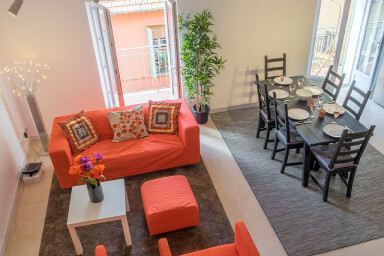 A perfect apartment for the large family or a group of friends on holiday together. For those of you who prefer to live like the locals this is a safe choice. Living room with, lounge area, dinner table and a fully fitted open kitchen. The traditional Suquet balcony extends along the entire façade with two doors from the living room. The bedroom (which is almost the same size as the living room) is divided in half by a wardrobe. In each section there are two single beds which makes a total of four beds in the bedroom. From the living room you have access to the mezzanine with two additional single beds. The apartment is located in the middle of Le Suquet, just a few minutes walk from the Beach (Plages du Midi), and yet close to the Palais des Festivals. A very good location both for holiday and congress. Le Suquet is for Cannes what Montmartre is for Paris and if you walk up the narrow, winding and cobbled streets up to the Château de la Castre you will have a great panoramic views of Cannes.